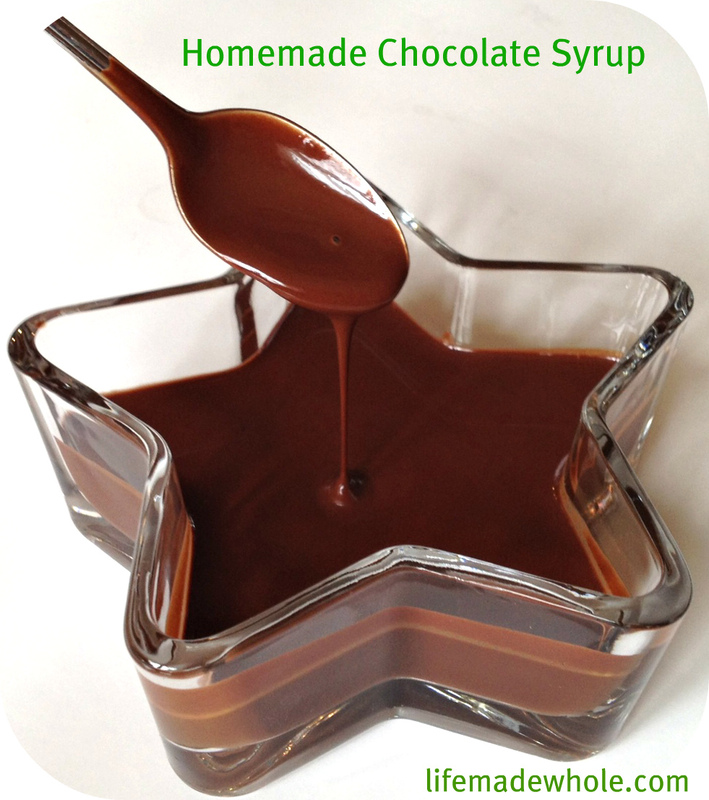 Homemade Chocolate Syrup – Without Refined Sugar! Ever since I determined my son could not tolerate corn syrup and I started eliminating it from our diets, my beloved chocolate syrup was no longer. I was not able to buy it in good conscience, even for just me, because if he couldn’t have it, I didn’t want it in the house. No sense having double standards. I lived without it for many years and tried different syrups, including one made by Trader Joe’s that tastes good but is extremely thick and also uses a lot of refined sugar. I decided to experiment and make my own. There are several recipes online using 1.5 CUPS of sugar but that was way too much refined sugar for my taste so I thought about replacing the sugar with a more healthy sweetener: maple syrup. Pure maple syrup has many benefits, including being an excellence source of manganese and zinc. Combine cocoa, water, maple syrup and salt in a small saucepan and bring to boil – stirring frequently to incorporate and prevent burning. Once it starts to boil, reduce heat and simmer for one minute, stirring often. Be careful not to burn. (If you do not have responsive burners, you may want to remove from heat source momentarily and return.) After one minute, remove from heat and add vanilla. Allow to cool and then store in the refrigerator. The syrup will thicken as it cools but should still be thin enough to squeeze out of a bottle (like for ketchup, etc.) This can be used for just about anything – chocolate milk, drizzle over raspberries (my personal favorite,) or as an ice cream condiment. Enjoy knowing that is is made with healthy ingredients!! This entry was posted in Desserts, Easy Kid Treats and tagged chocolate, chocolate syrup, maple syrup. Bookmark the permalink. 8 Responses to Homemade Chocolate Syrup – Without Refined Sugar! It looks awesome and even pretty healthy! How long would the sauce last in the fridge? Probably at least a week. None of these ingredients would go bad quickly in and of themselves. I would say you would get at least 2 weeks out of it. Just be sure to shake it before serving. have you tried it with Agave? thanks for the info. I will read up on it. Thanks so much for the agave link! Maple syrup is one of my staples. Try a teaspoon in your coffee. I have my own inexpensive stove top espresso maker and so far the only milk replacement that tastes good is the coconut almond milk. ( the dairy industry is inhumane and dairy isn’t good for us – like why don’t we drink dog milk! It’s all about the money folks and good marketing.). In this recipe, I might use almond coconut milk instead of water, and add a teaspoon of instant coffee since I love mocha. Sometimes I add a teaspoon of cocoa to my coffee. No silly Starbucks overpriced coffee for me, plus I buy a great dark fair trade coffee and grind the beans. I like my coffee first thing in the morning before I go anywhere. Looking forward to playing around with your recipe. Thanks for the info on agave syrup. Thanks for you comments! You have some great ideas!